Florida Cooperative Extension is a partnership between UF/IFAS, United States Department of Agriculture, and county governments in Florida to provide scientific knowledge and expertise to the public through non-resident educational programs. Beauty's Haven Farm & Equine Rescue, Inc.
Beauty's Haven is an independent all-breed equine rescue, doing a lot of good in my area. Your Southern Source for Everything Horse! Thousands of equine related links. 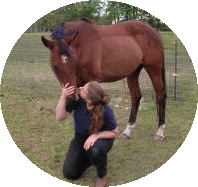 Equestrian resource with emphasis on the Eastern U.S.
An insight into Lynn Wilson's take on alternative health, holistic practices and horsemanship, that encourage that elusive, all important, sense of well being for people and animals alike. Pet Pages is a directory of Pet Shops, Veterinarians, Pet Grooming and Pet Health providers, listed by the state. Our pet categories offer a wide array of information about dogs, cats, horses, fish, birds, ferrets, small pets, reptiles, and amphibians. Would you like to be listed on my links/webrings page? Visit the Forum and read my post on reciprocal links.